ww2dbaseNew Jersey was the second ship of the Iowa-class battleships. She was christened by Carolyn Edison, wife of New Jersey Governor and former Secretary of the Navy Charles Edison. She was named personally by President of the United States Franklin Roosevelt to pay back a political favor given to him by Edison. She was commissioned in 1943 amidst WW2 with Captain Carl Holden in command. On 7 Jan 1944, she passed through the Panama Canal. On 22 Jan, she joined the US Navy 5th Fleet in the Pacific Ocean. ww2dbaseBetween 29 Jan and 2 Feb 1944, New Jersey screened for aircraft carriers as carrier aircraft supported the invasion of Marshall Islands. On 4 Feb, at Majuro of Marshall Islands, she became the flagship of the 5th Fleet under Admiral Raymond Spruance. Between 17 and 18 Feb, she boarded Spruance as he oversaw Operation Hailstone against the Japanese base at Truk in the Caroline islands; during the operation, she destroyed a trawler and jointly sank the Japanese destroyer Maikaze with other American warships. She returned to the Marshall Islands on 19 Feb. Between 17 Mar and 10 Apr, she supported the air and surface bombardment of Mille. After supporting an aerial strike on the Palau Islands, she returned to Majuro, where Spruance transferred his flag to cruiser Indianapolis. ww2dbaseOn 22 Apr, New Jersey supported the landings at Aitape, Tanahmerah Bay, and Humboldt Bay at New Guinea. Between 29 and 30 Apr, she attacked shipping and bombarded shore facilities at Truk; at the latter location, her primary guns heavily damaged fuel tanks, the airfield, and a headquarters building. ww2dbaseOn 6 Jun, New Jersey departed Majuro for the Mariana Islands. On 12 Jun, the second day of carrier aircraft strikes against Japanese targets, she screened against a Japanese aerial attack, shooting down one torpedo bomber. On 13 and 14 Jun, she bombarded Saipan and Tinian to soften the defenses for the landings scheduled for 15 Jun. During the Battle of the Philippine Sea on 19 Jun 1944, she offered anti-aircraft protection for the American carriers against the Japanese air attack. After screening strikes against Guam and the Palau Islands, she sailed for Pearl Harbor, Hawaii, United States. ww2dbaseOn 9 Aug 1944, New Jersey arrived at Pearl Harbor. She took on Admiral William Halsey on 24 Aug and became the flagship of the US 3rd Fleet. On 30 Aug, she departed Pearl Harbor for Ulithi in the Caroline Islands, a base from which Halsey's carrier fleet would strike at Japanese bases at the Philippine Islands, Okinawa, and Taiwan. In Oct 1944, she supported the American landings at Leyte, Philippine Islands. On 24 Oct, New Jersey and the rest of Halsey's main strength were drawn away by Jisaburo Ozawa's decoy fleet, away from Samar where a Japanese surface fleet, which included the battleship Yamato, defeated an American task force and nearly endangered a fleet of important transports. On 27 Oct, she joined other battleships to screen for carriers as their aircraft attacked Japanese positions on the Philippine island of Luzon. On 29 Oct, the fleet came under suicide attack; anti-aircraft weapons of New Jersey and carrier Intrepid together downed a special attack aircraft, but stray shots from Intrepid also wounded three men aboard New Jersey. Through Oct and Nov, the fleet would face similar special attacks, and New Jersey claimed or shared credit for downing several aircraft. ww2dbaseIn Dec 1944, New Jersey and other ships of Task Force 38 were hit by Typhoon Cobra in the Pacific Ocean. The typhoon claimed a number of ships, aircraft, and hundreds of lives, but New Jersey escaped relatively unscathed. She returned to Ulithi on 24 Dec.
ww2dbaseBetween 30 Dec 1944 and 25 Jan 1945, New Jersey escorted carriers as their aircraft struck Taiwan, Okinawa, Luzon, Indochina, Hong Kong, and China. On 27 Jan, Halsey departed from New Jersey. On 29 Jan, she became the flagship of Rear Admiral Oscar Badger's Battleship Division 7. New Jersey screened carrier Essex's group between 19 and 21 Feb during the invasion of Iwo Jima. On 25 Feb, she screened carriers during the first major carrier raid on the Japanese capital city of Tokyo. On 27 Feb, she screened carriers as their aircraft conducted an attack on Okinawa. Between 14 Mar and 16 Apr, she supported operations on Okinawa, defending carriers from Japanese air attacks and bombarding shore positions with her guns. ww2dbaseAfter several months of overhaul at Puget Sound Naval Shipyard, Bremerton, Washington, United States, battleship New Jersey departed on 4 Jul for Guam of the Mariana Islands via San Pedro, Pearl Harbor, and Eniwetok. At Guam, she became Spruance's flagship once again on 14 Aug. After the Japanese surrender, she arrived at Tokyo Bay on 17 Sep where she served as flagship for several admirals until relieved by sister ship Iowa on 28 Jan 1946. As part of Operation Magic Carpet, she brought back nearly one thousand troops back to San Francisco, California, United States, arriving at 10 Feb.
ww2dbaseAfter operations on the west coast of the United States, New Jersey reached Bayonne, New Jersey to celebrate her anniversary of commissioning on 23 May 1947. Between 7 Jun and 26 Aug, she served as a training ship to Northern European waters and the Caribbean Sea. During that time, on 23 Jun, she became the flagship of Admiral Richard Connolly, Commander Naval Forces Eastern Atlantic and Mediterranean, at Rosyth, Scotland, United Kingdom. Also during the training, on 2 Jul, King Haakon VII of Norway inspected the crew at Oslo, Norway. After returning, she was the flagship of Rear Admiral Heber McLean of Battleship Division 1 at New York, United States. She was decommissioned at Bayonne, New Jersey on 30 Jun 1948.
ww2dbaseOn 21 Nov 1950, New Jersey was reactivated for service for the Korean War with Captain David Tyree in command. After training in the Caribbean Sea, she departed from Norfolk, Virginia, United States on 16 Apr 1951 and sailed for Japan; she arrived in Korea on 17 May, where she became the flagship of Vice Admiral Harold Martin of the US 7th Fleet. On 20 May, her guns bombarded Wonsan, the first of many naval gunfire support missions that characterized her career during the Korean War. During this first bombardment mission, she received her first and only combat casualty of the Korean War: one of her men was killed and two severely wounded when a coastal battery scored a direct hit and a near miss on New Jersey. Between 23 and 27 May and again on 30 May 1951, she caused heavy damage to enemy troop concentrations, ammunition dumps, and a bridge near Yangyang and Kansong. On 18 Jul, she scored five direct hits on coastal gun emplacements, destroying them. On 16 Oct, after a great many shore bombardment missions, she hosted General Omar Bradley and General Matthew Ridgeway as they arrived to confer with Admiral Martin. She would return to bombardment missions after the meeting, frequently delivering heavy damage to communist targets. In Nov, she completed her first tour in Korea as she was relieved by battleship Wisconsin. She sailed for Norfolk via Yokosuka, Long Beach, and the Panama Canal, arriving on 20 Dec, where she underwent a six-month overhaul. In Jul, upon completion of the overhaul, New Jersey conducted another training mission to Cherbourg, Lisbon, and the Caribbean Sea. On 5 Mar 1953, she departed Norfolk for her second tour in the Korean War, arriving in Yokosuka on 5 Apr and becoming Admiral Joseph Clark's flagship on 6 Apr for the 7th Fleet. She returned to the familiar bombardment role on 12 Apr against Chongjin, scoring seven direct hits in seven minutes, destroying an enemy communications building. On 14 Apr, at Pusan, Korea, her crew manned the rails to welcome the President of the Republic of Korea Syngman Rhee, his wife, and American Ambassador Ellis Briggs. On 23 May 1953, New Jersey's 10th anniversary of commissioning, the occasion was celebrated with President and madame Rhee, Lieutenant General Maxwell Taylor, among others; after an extra day of rest for the crew, she returned to bombardment duty on 25 May, followed by many similar missions in the following two months. Her final mission in Korea was the bombardment of enemy positions near Wonsan on 26 Jul 1953, during which she destroyed guns, bunkers, and trenches. As the Korean War came to an end, she enjoyed a seven-day visit at Hong Kong between 20 and 27 Aug. She returned to patrol Japanese and South Korean waters until relieved by Wisconsin on 14 Oct. Before that time, on 16 Sep, President Rhee came aboard New Jersey and awarded the Korean Presidential Unit Citation to the men of the US 7th Fleet. ww2dbaseOn 14 Nov 1953, New Jersey reached Norfolk. She hosted midshipmen as a training ship for the following two years and participated in exercises. On 7 Sep 1955, she joined the US 6th Fleet in the Mediterranean Sea, and in the following few months made port calls at Gibraltar, Valencia, Cannes, Istanbul, Souda Bay (Crete, Greece), and Barcelona. She returned to Norfolk on 7 Jan 1956 and became a training ship once gain. On 27 Aug, she became the flagship of Vice Admiral Charles Wellborn, Jr. of the US 2nd Fleet, in that role, she participated in NATO exercises off Scotland, United Kingdom and paid an official visit to Norway where she hosted Crown Prince Olav. She returned to Norfolk on 15 Oct. On 14 Dec, she arrived at the New York Naval Shipyard for inactivation. She was decommissioned for the second time on 21 Aug 1957 at Bayonne, New Jersey. ww2dbaseOn 6 Apr 1968, New Jersey was recommissioned during the Vietnam War, becoming the world's only active battleship. 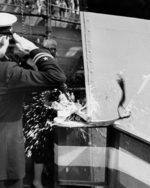 The recommissioning took place after a period of modernization, and the ceremony was conducted at the Philadelphia Naval Shipyard with Captain J. Edward Snyder in command. She departed Philadelphia, Pennsylvania, United States on 16 May 1968, passing through the Panama Canal on 4 Jun, and arrived at Long Beach, California on 11 Jun. On 24 Jul, she received shells and powder from a helicopter, which was the first time a battleship received ammunition by helicopter lift at sea. She departed Long Beach on 2 Sep and sailed west. Reaching Vietnam at the end of the month and fired her first shots in over 16 years on 30 Sep near the 17th parallel. Similar to Korea, she performed many naval gunfire bombardment missions, but occasionally she acted as an anti-aircraft battery as well. On 16 Oct, for example, she destroyed 13 structures and an artillery site at a communist base using both her primary and secondary guns. On 29 Oct, she destroyed 30 structures, collapsed 3 underground bunkers, and an artillery position. One of her most successful bombardment mission took place on 25 and 26 Nov when she destroyed 192 structures, damaged 93 structures, destroyed 54 bunkers, and collapsed several tunnel complexes near Quang Ngai. When she departed Vietnamese waters on 1 Apr 1969, she had fired 5,688 rounds from her primary guns and 14,891 rounds from her secondary guns. She departed Japan for the United States on 9 Apr, but an incident of North Korean fighter jet downing an American EC-121 Warning Star surveillance aircraft sent her back to Japan to prepare for a possible conflict. Because the situation never escalated, she once again departed for the United States, reaching Long Beach, California on 5 May 1969. On 22 Aug, the United States Secretary of Defense released a list of warships to decommission, and New Jersey was on the top of the list. On 27 Aug, Captain Snyder was relieved by Captain Robert Peniston, who led the ship to Puget Sound Naval Yard and oversaw the inactivation overhaul. She was decommissioned on 17 Dec 1969.
ww2dbaseOn 28 Dec 1982, New Jersey was recommissioned at Long Beach, California to be a part of President Ronald Reagan's 600-ship Navy. Prior to the recommissioning, some of her weaponry were removed and replaced with modern counterparts, including four MK 141 quad cell launchers for 16 AGM-84 Harpoon anti-ship missiles, eight Armored Box Launcher (ABL) mounts for 32 BGM-109 Tomahawk missiles, and a quartet of the United States Navy's Phalanx Close In Weapon System (CIWS) gatling guns for defense against enemy anti-ship missiles and enemy aircraft. ww2dbaseOn 18 Apr 1983, a van with a 2,000-pound load of explosives detonated at the US embassy in West Beirut, Lebanon, killing 63. By Aug, the civil war in Lebanon had escalated, with US Marines stationed in the Chouf District in southeastern Beirut taking fire from Lebanese Druze rebel militiamen. On 29 Aug, two Marines were killed and 14 were wounded during an attack. New Jersey and other warships were dispatched to the region. She arrived off Lebanon on 25 Sep. On 14 Dec, she fired 11 rounds from her 16-inch primary guns; these were the first 16-inch shells fired in combat anywhere in the world since New Jersey last fired her guns in Vietnam in 1969. On 24 Dec, she hosted Bob Hope and other entertainers for a Christmas show. On 8 Feb 1984, she fired almost 300 shells against Druze and Syrian positions in the Bekaa Valley east of Beirut, killing the Syrian commanding general and other senior officers. The accuracy of her guns came in to question as some of her stray rounds hit civilian residential districts and killed innocent civilians. The US Navy blamed inconsistent powder bags. ww2dbaseIn 1986, New Jersey joined the Pacific Fleet as the main ship of her own battleship battle group, operating off Thailand. Between late 1987 and 1988, she was overhauled at Long Beach, California. Between 1988 and 1989, she served off Korea and Australia, participating in the Australian bicentennial celebrations. In 1989, she participated in Pacific Exercise '89, and then sailed for Persian Gulf, where she remained until Feb 1990. She departed before the start of Operation Desert Storm and the First Gulf War. ww2dbaseOn 8 Feb 1991, New Jersey was decommissioned for the final time at Naval Station Long Beach, California. She was towed to Bremerton Washington, where she remained in reserve. On 12 Sep 1999, she was towed to Philadelphia Naval Shipyard by tug Sea Victory, where she remained while Bayonne and Camden, two cities in New Jersey, competed to host the battleship. On 20 Jan 2000, Secretary of the Navy Richard Danzig announced that Camden would be the battleship's final home. On 15 Oct 2001, she began her career as a museum ship at Camden, where she still remains today. 23 May 1943 USS New Jersey was commissioned into service at Philadelphia Navy Yard, Pennsylvania, United States. 25 Jan 1944 The newly operational battleship, USS New Jersey (Captain Carl F. Holden), joined Rear Admiral Frederick C. Sherman's TG58.3 (Group Three of Vice Admiral Marc A. Mitscher's Task Force 58) in time to participate in Operation Flintlock, the occupation of the Marshall Islands. 26 Jan 1945 Captain Edmund Wooldridge was named the commanding officer of USS New Jersey. 15 Nov 1945 Captain Edmund Wooldridge stepped down as the commanding officer of USS New Jersey. 1 Feb 1991 New Jersey was decommissioned from service. The length of N.J. is 887-7 long and 108-3 beam. Yor turret information on armor thickness and the conning tower are incorrect. The barbett and conning tower are 17.5 inches thick tapereing below decks down to 11 thick. The decks are thicker then 1-12 inches. And the fost two Iowas deck armor strakes are 58 thick. The second two Iowas are 34 thick on the strakes. My wife, son, daughter in law and myself spent a good long afternoon on the New Jersey. There was a Reunion of one of the Crews and they added another dimension to the tour. While you are there take the boat across the Delaware to the Pennsylvania side. On that side they have a World War Two Sub, and the flag ship of Commodore Perry from the Spanish American War. It is wonderful to see how things changed on Flag ships from 1898 until the New Jersey still being used in 1998.
my dad louis n. paauwe is a plank member of the uss new jersey and would like to find out where he would have been stationed during battle which guns i thought a 16 inch but i think my mom sait one of the anti aircraft gun. my dad dead now so cant ask. Am interested in any information on the USS New Jersey in WWII. My Grandfather, Ralph Robbins, was a Gunner.